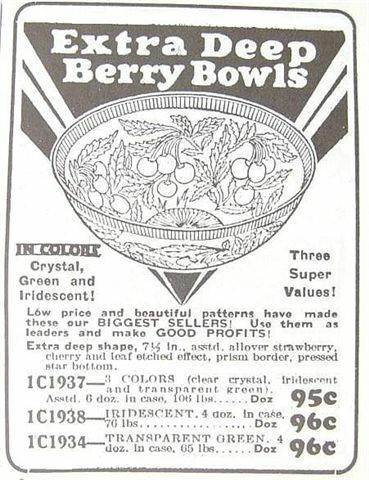 STIPPLED STRAWBERRY in Mid -Winter 1927 Butler Bros. Catalog. April 1931 Butler Bros. Ad. 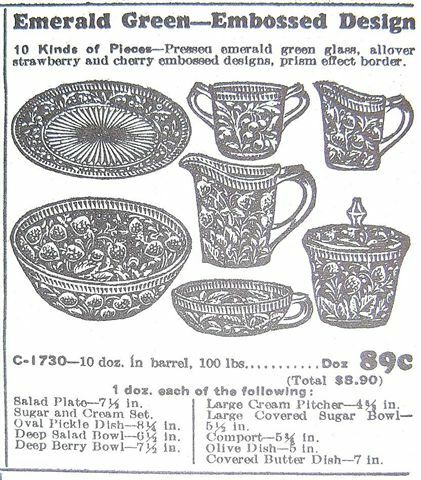 Various selections of these designs were included in Butler Brothers Wholesale catalogs from 1927 to the early 1930s. 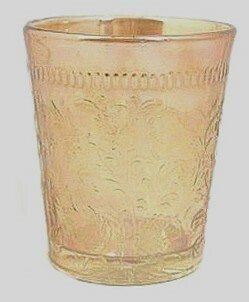 They are another of the indications that manufacture of glassware was changing with the times. 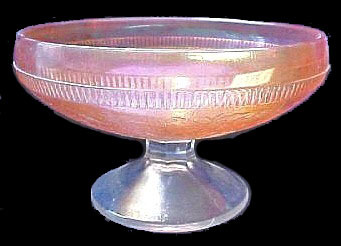 As moods of the buying public shifted from the more heavily iridized glassware of previous years, but continued to enjoy “some” color, production experienced a gradual change-over with items such as seen in this segment, giving way to the more discreet patterning as found in the Depression glass which followed. - April 1929 Butler Bros. Catalog. 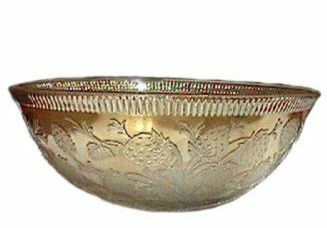 CHERRY-BERRY or CHERRY SMASH Bowl , 7.5 in. diameter. CHERRY-BERRY or CHERRY SMASH? 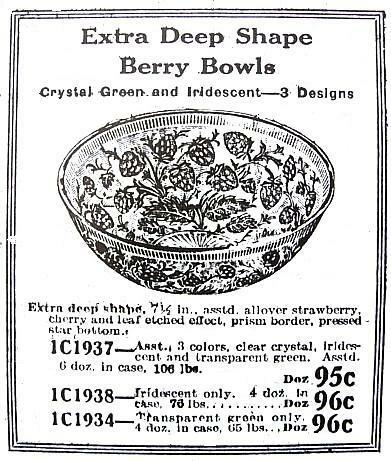 : This 7 ½” bowl has the same perpendicular markings as the Stippled Strawberry pieces. 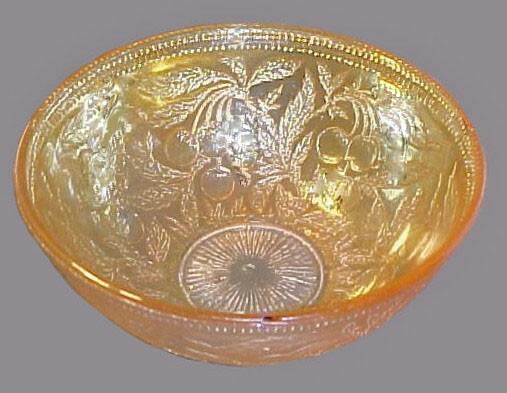 No doubt made during the early days of Depression Glass, when items of the utilitarian variety were attractively presented to the public in light marigold. Left - Seven 1/2 inch STIPPLED STRAWBERRY Bowl. Right - STIPPLED STRAWBERRY Custard Cup. 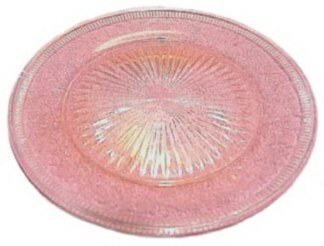 Left -STIPPLED STRAWBERRY Jelly Dish - 5 1/8 in. tall. Right - STIPPLED STRAWBERRY Plate -7.5 inches across. Left - STIPPLED STRAWBERRY 8 inch Pitcher. Right - STIPPLED STRAWBERRY Sherbet. Left - STIPPLED STRAWBERRY - 3 1/2 in. tall x 2 1/4 in. base. 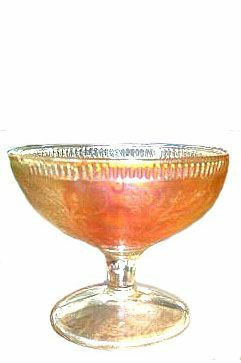 Right - Base of STIPPLED STRAWBERRY Tumbler - circa 1930. 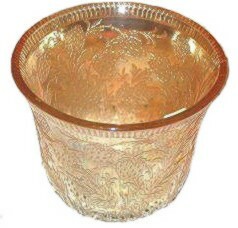 STIPPLED STRAWBERRY: The Custard Cup, Stemmed Sherbet, and Tumbler in this pattern clearly display the very different edge design from that used on the Jenkins Glass pattern they called Strawberry. 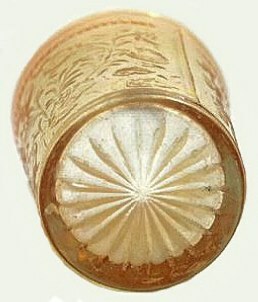 The Jenkins design is more a checkerboard characteristic, as opposed to the repeat of a perpendicular upper edge design used on the examples from U.S. Glass Company. 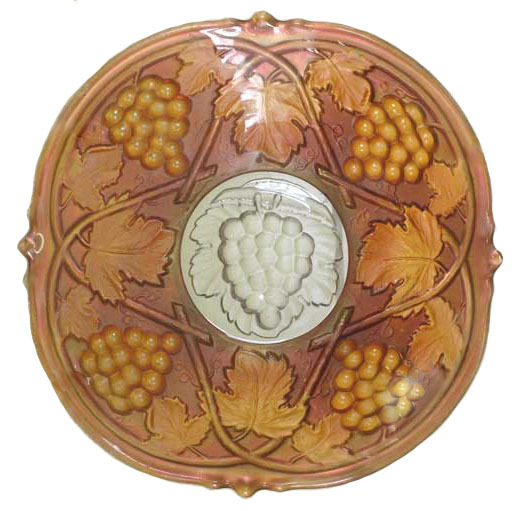 The photo provided here of the 8” salad plate in Stippled Strawberry is not the best in the world, but its existence in marigold is at least verified! PALM BEACH - 7 inch Plate in Amethyst with gold extertior. PALM BEACH Plate: These amethyst pieces are certainly not often seen. 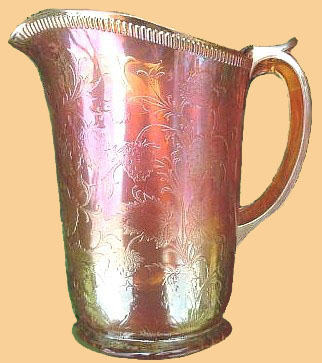 It is iridized but has a gold exterior, making it quite unusual. Through Christ, all sin is already forgiven. But we claim and experience that forgiveness by confession. The joy of fellowship with God is then restored, and the Holy Spirit is free to fill us and change us (Romans 8:13; Galatians 5:22-23; Ephesians 5:18.). The confession of sin is an important part of the Christian’s life; it brings the cleansing Christ provided (1 John 1:7).